Microsoft reported its second quarter earnings with a 12% revenue gain and 18% gain in operating income from the year prior, with earnings per share of $1.08. Revenue of $32.5 billion was on target with analyst estimates. 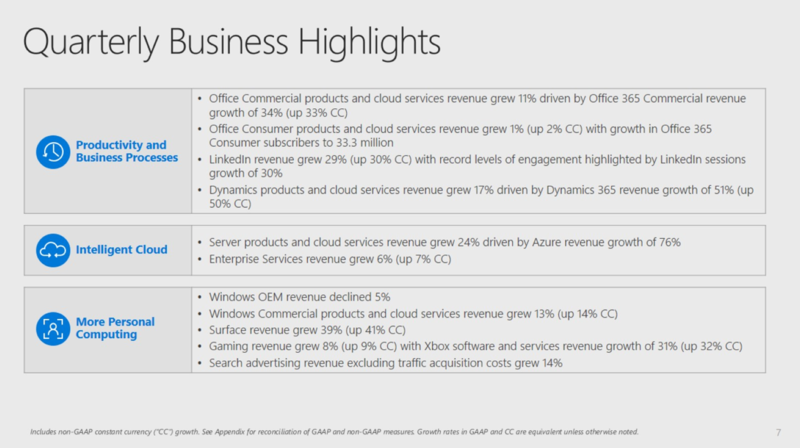 In FY2019 Q1, Microsoft reported Dynamics 365 revenue growth of 51%. In FY 2018 Q3, Dynamics revenue growth was 65%. In FY 2018 Q2 it was 67%. Intelligent Cloud delivered revenue of $9.4 billion, an increase of 20%. The ever-important Azure revenue growth rate remaining steady at 76%. “Our strong commercial cloud results reflect our deep and growing partnerships with leading companies in every industry including retail, financial services, and healthcare,” said Satya Nadella, CEO of Microsoft in a statement.